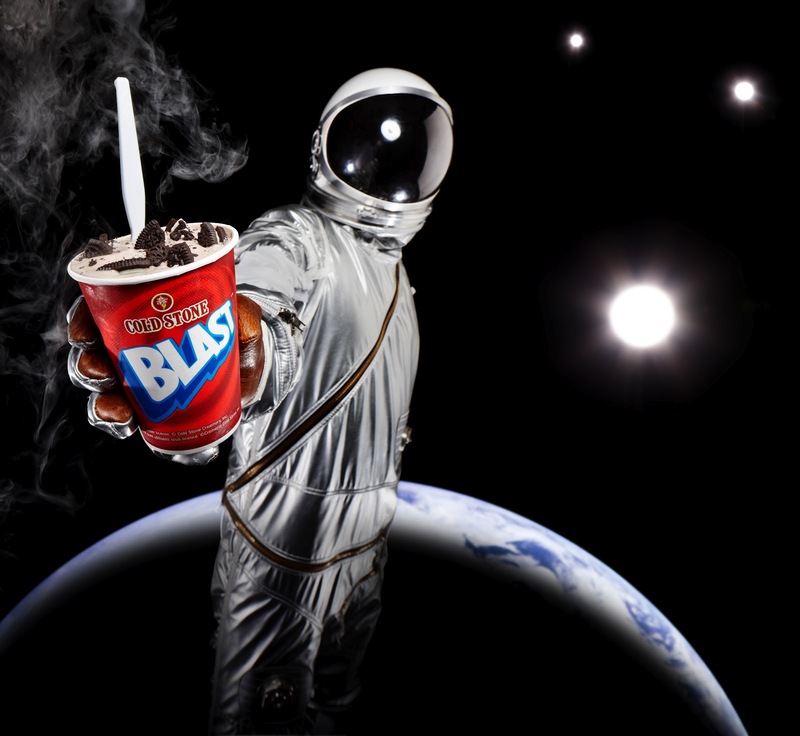 MISSION CONTROL, PREGGO HAS A CRAVING: NEW COLD STONE BLAST READY FOR TAKE OFF! And when a craving hits, it must be satisfied! I have been craving many things this pregnancy, but one thing that I love, love, love is my ice cream. 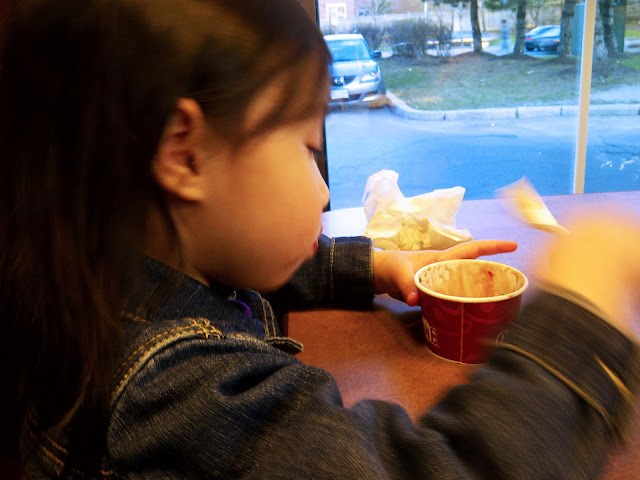 I came to learn that one of my favourite ice cream shops, Cold Stone Creamery (Co-branded by yet another favourite of mine, Tim Hortons) launched a brand new premium ice cream treat on April 12th to add to their already delicious selection of ice cream and sorbet flavours – The Cold Stone Blast™! To experience Cold Stone, you simply choose your cone or cup size – Like It™, Love It™, Gotta Have It™– ice cream or sorbet and any number of countless mix-ins such as fruit, nuts, candies and other toppings. A Team Member mixes the selections with spades on a chilled granite stone right in front of you, and the creation is presented to you as The Ultimate Ice Cream Experience®. You can also enjoy Cold Stone Creamery’s take-home treats such as ice cream cookie sandwiches, cupcakes, pies and cakes. I love their waffle cones – so delicious! And perfect with your choice of ice cream or sorbet creation. My usual favourite at Cold Stone is their Cheesecake Fantasy. Yum! So back to the yummy new Cold Stone Blast – seriously, you have to try it! It’s like a smoother, creamier version of ice cream. Perfect treat to carry around on those warm days. Another pregnancy craving combo? Chocolate + Peanut Butter. Two of the best combinations, ever! I had to try this for myself, so of course I popped in with my family as an after dinner treat yesterday (the weather was perfect for it!) 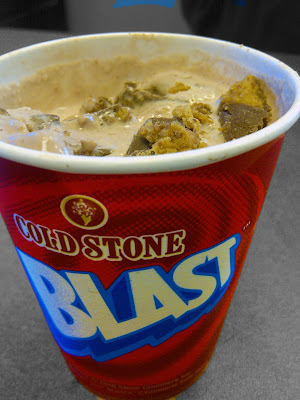 and ordered the Peanut Buter Chocolate Cold Stone Blast. Do you see the large Reese Peanut Butter Cup Pieces? Ava enjoyed her favourite flavour, plain chocolate ice cream, with sprinkles of course! In celebration of the introduction of the Cold Stone Blast, any Love It (medium) size Cold Stone Blast or Signature Creation is just $2 from April 16-22nd! Sweet! To find the nearest Cold Stone Creamery location near you, visit http://www.timhortons.com/coldstone. I loved it so much, I really wanted to give my lovely readers a chance to WIN a gift card for Cold Stone Creamery for them to try the new Cold Stone Blast on their very own! (Hotel) Gelato, Wine, Mac and Cheese… Oh My! Cold Stone has some awesome ice cream. Mmmm I can’t wait to pick some up soon! Yummm I love ice cream! I’m also a fan of Peanut Butter and Chocolate! Yummy!